Now, of course I prefer always making fresh wholesome meals, but every now and then you need something FAST! 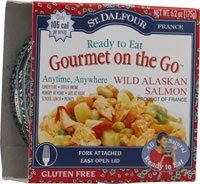 I tried this canned ready to eat salmon meal with as much skepticism as you can imagine. How, I wondered, could that possibly be good? Well, I was pleasantly surprised to find out that it actually is quite good and filling! One of these cans of salmons, beans, potatoes and vegetables contain 8g of fiber and 14g of protein! Now THAT is a serving. That weighs in with a small 210 calories and minimal fat. The salmon used is a Wild Alaskan variety, which should help with those omega 3 boosts we are all looking for. I think this is a good choice for anyone looking to boost their protein intake without boosting their overall fat consumption as well. To add to this, it's clearly labeled gluten free, it is all natural with simple ingredients AND it even comes with a spork! For those of you who are looking for a quick meal to have on hand, or travel with, I give this a thumbs up for taste, convenience, price AND nutrient value!